People around the world go wild for wildlife! Geneva, 3 March 2014 – From Geneva to Tokyo and from New York to Nairobi, people around the world are today celebrating World Wildlife Day for the first time ever. Special events to mark the day are planned in Bangladesh, Belgium, Cameroon, Canada, China, Germany, Greece, India, Kenya, Malawi, Mongolia, New Zealand, Oman, Pakistan, Peru, South Africa, South Korea, Sri Lanka, Switzerland, Thailand, Togo, the United Kingdom, the United States of America, Viet Nam and Zimbabwe, among others. Overwhelming support for World Wildlife Day has come from countries across all regions and organisations dealing with agriculture, development, nature conservation and maritime matters to Customs, justice and police as well as the economy, finance, trade and tourism. Civil society groups from across the globe and many committed individuals have also expressed their enthusiastic support for wildlife as has the private sector. Social media networks have been mobilized world-wide under the hash tag #WorldWildlifeDay and the slogan: ‘let’s go wild for wildlife’. World Wildlife Day gives the international community a day to celebrate wildlife, to reflect on the relationship between humans and wild plants and animals, and to find pathways for a sustainable future where people and wildlife can coexist in harmony. People around the world have clearly embraced the Day. "While the threats to wildlife are great, we can reduce them through our collective efforts. On this inaugural World Wildlife Day, I urge all sectors of society to end illegal wildlife trafficking and commit to trading and using wild plants and animals sustainably and equitably", U.N. Secretary-General Ban Ki-Moon said in declaring today to be the inaugural World Wildlife Day. CITES Secretary-General John E. Scanlon said “We are thrilled by the enthusiasm and overwhelming support for wildlife coming from so many places and people. 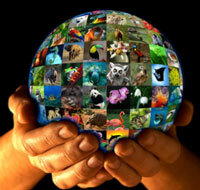 It gives us great hope that we can secure a sustainable future for wild plants and animals, as well as for ourselves”. “This special Day in the UN calendar has given the world a chance to reconnect with our planet’s wild side and has drawn global attention to our collective responsibility - as citizens and consumers - to bring the illegal wildlife trade to an end” added Scanlon. On 20 December, the UN General Assembly proclaimed 3 March, the date of the adoption of the Convention on International Trade in Endangered Species of Wild Fauna and Flora (CITES), as World Wildlife Day, to celebrate and raise awareness of the world’s wild fauna and flora. The CITES Secretariat was honoured to have been requested by the UN General Assembly to facilitate the implementation of World Wildlife Day in collaboration with relevant UN organisations. In Geneva the "Wild and Precious” exhibition featuring photos of seven of the world's most renowned nature photographers, is being unveiled at the Palais des Nations, in the presence of Ban Ki-moon, Secretary-General of the United Nations, John W. Ashe, President of the General Assembly, Didier Burkhalter, President of the Swiss Confederation and Yan Arthus-Bertrand President of the GoodPlanet Foundation to showcase the beauty of wildlife. The event is being sponsored by the Permanent Missions of Switzerland,Thailand and of the Kingdom of Great Britain and Northern Ireland together with the CITES Secretariat. In Tokyo, the United Nations University is hosting a Conference on Combating Wildlife Crime to raise public awareness on the urgent need to step up the fight against wildlife crime, which has wide-ranging economic, environmental and social impacts. In New York, the Permanent Missions to the United Nations of Germany and Thailand are organizing an event focused on wildlife and people and the role played by wildlife in sustainable development and human well-being.